The Real Housewives of Beverly Hills is an American 60 minute reality romance television series, which kicked off on October 14, 2010, on Bravo and is broadcast every Tuesday at 21:00. The show is currently in its 9th season. 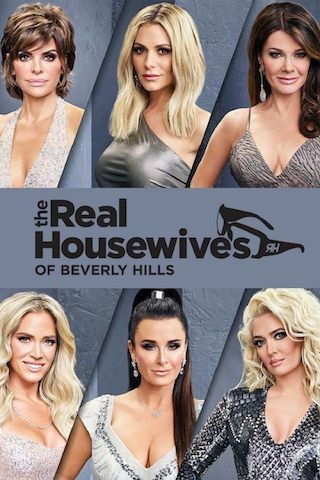 Bravo is yet to announce the renewal of The Real Housewives of Beverly Hills for Season 10 as well as its cancelation. Sign up to track down the show's status and its release date. The Real Housewives of Beverly Hills offers a glimpse inside the world of luxurious wealth and pampered privilege, where being seen and who you know is everything. These women are in the center of it all and they have the mansions, the cars, and the diamonds to prove it. From heiresses to entrepreneurs to a family of child actresses - they deliver the star power and the drama. This season, the stakes are higher than ever for each of the ladies, and while there is no shortage of laughs, they are forced to navigate a string of confrontations that could change the dynamic of the friends group forever. Following her brother's recent passing, Lisa Vanderpump puts all her energy into her family, work demands and maintaining a positive attitude. Kyle is settling into her new house after a well-publicized robbery and sending her daughter Sophia off to college, all while trying to determine the future of her Beverly Hills clothing store. Feeling like she's found her mojo, Dorit is expanding her swimwear line to include a lifestyle brand, but working against tight deadlines makes her realize she may have bitten off more than she can chew. Meanwhile, Erika takes the ultimate leap of faith - and financial risk - when she embarks on an Erika Jayne National Tour, hoping her fans will show up to support her. As her business flourishes into a multi-million dollar empire, the always-on-the-go Teddi must adjust to the newfound pressures of running her company while simultaneously maintaining her supermom status. Lisa Rinna begins to wonder if acting still excites her, while coping with an empty household, as her husband is constantly traveling and her model daughters are getting ready to leave the nest. Camille is prepping for her wedding day and though she is more than ready to leave the past behind, moving forward might not be as easy as she had hoped.